Scholar, author, editor, teacher, reformer, and civil rights leader, W. E. B. Du Bois was a deeply influential figure in American life and one of the earliest proponents of equality for African Americans. He was a founder and leader of the Niagara Movement; the NAACP, and the Pan-African Movement; a progenitor of the 1920’s Harlem Renaissance; an advocate of anti-colonialism, anti-imperialism, unionism, and equality for women; and a champion of the right of oppressed people around the world. To mark the 50th anniversary of Du Bois’s death, The University Museum of Contemporary Art (UMCA) at the University of Massachusetts Amherst commissioned ten leading artists from the United States, Canada, and West Africa to create original work that reflects on Du Bois’s legacy and reconsiders him in light of today’s issues. In all, ten artists delved into the vast Du Bois archives at UMass Amherst and consulted with Du Bois scholars both on and off campus as they conceived of their work. The new pieces created by Radcliffe Bailey, Mary Evans, Brendan Fernandes, LaToya Ruby Frazier, Julie Mehretu, Ann Messner, Jefferson Pinder, Tim Rollins and KOS, Mickalene Thomas, and Carrie Mae Weems were displayed in an exhibition titled Du Bois in Our Time. The range of artworks they produced is astounding—including photography, painting, sculpture, works on paper, video installations, as well as a proposal to create a memorial garden in honor of Du Bois. Some artists were inspired by Du Bois’s poems, some by his early anticipation of women’s rights and the environmental movement, some by his warnings against nuclear proliferation. Others found inspiration in the groundwork he laid for movements of public dissent, while others showed that the issues Du Bois worked on a century ago are still with us, and in certain cases more urgent than ever. 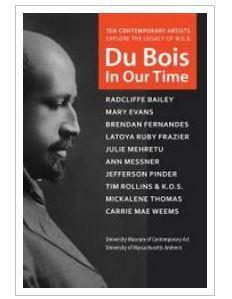 This catalog contains selected images from the exhibition, statements from the artists testifying to the inspiration and impact Du Bois has had on their lives and work, an essay by Johnnetta Cole, and an introduction by Loretta Yarlow, director of the University Museum of Contemporary Art..